Why would you want to waste a perfect skiing day in a conference room? And why spend a miserable day out on the slopes? Wouldn't you rather be outside when the conditions say skiing, and inside learning advanced Scrum topics – from one of the best agile trainers in the world – when skiing wouldn’t be fun anyway? The agile approach to weather. A whole new concept in response to mankind's dismal weather forecasting record. In our stand-up each morning we'll decide whether to go skiing, if the weather is right, or whether to do one of the two Advanced Scrum training days. Everybody talks about a good work-life balance. We implement it! Get the best out of five days in Davos. Don't sit in a room when the sun is shining and skiing is perfect, wishing you were out on the slopes. And don't be out there when weather is ugly, wishing you could be inside. It’s far better to spend those days with learning about advanced Agile and Scrum topics and sharing your experiences with others. Family is important, so Henrik is bringing his family along for exactly that reason. So is Klaus, Agile coach and organizer of this event. You are welcome to do so too. The price for accompanying family members excludes the course, obviously, and so is substantially lower. As a matter of fact, children staying in the same room as their parents need only pay for breakfast. At 1500m above sea level the highest situated city in the Alps, which makes the snow very reliable. A fantastic destination with lots of history as one of the oldest skiing resorts in Switzerland. Prince Charles’s ski resort of choice and also, of course, the place where the World Economic Forum meets every year. Get more information about Davos here. This is not only about Scrum training and skiing, it is about networking. We expect participants from all over the world for this gathering. People who will contribute their own experience and ideas to the course. So you will have the opportunity to network and share knowledge with like-minded people from other countries and cultures. To maximize networking opportunities for participants we will facilitate communications by setting up a slack for all participants. That way you can socialize with like-minded people: meet them for a lunchtime discussion on the mountain, organize an evening where you present your favourite topic (our training room will be available to the group throughout the whole week), invite people for debates in front of the fireplace in the hotel lobby, and so on. Connect with new and interesting people. 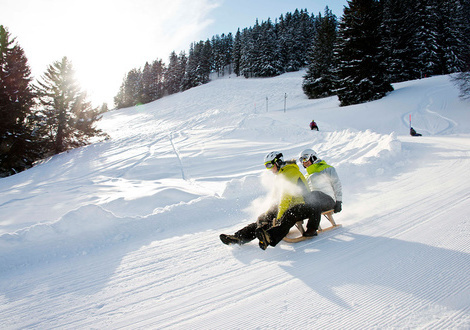 There are lots of alternatives for non-alpine skiers, such as cross-country skiing, ice skating, tobogganing, snow shoeing, shopping, and many more. See a list of winter activities here. Each day there is one free activity: "Davos Klosters Inside", the free guest programme, offers daily winter experiences accompanied by local insiders. Experience sunrise on the mountain, take a glimpse behind the scenes at the Piste and Rescue Service, or take part in a torchlight hike. Monday, 25 Feb: Conditions for skiing are relatively good and there are only a few clouds predicted for today. At 8:15 during breakfast we decide to go skiing. Sophia does a 2-hour beginners ski class with those interested. In the evening everybody meets for the social get-together (dinner). Tuesday, 26 Feb: Subarctic temperatures the mountain and strong winds. Overcast => Everybody agrees at breakfast that today we will be doing training. We don't go skiing but stay in our training room in the hotel and Henrik does his first workshop day with us. Wednesday, 27 Feb: Overnight we get 24 cm of fresh powder snow. The weather forecast shows a few clouds in the morning and sun all afternoon. During the daily stand-up at 8:15 we quickly agree to go skiing. Sophia does off-piste skiing with those interested. A group of six people decide to go tobogganing instead and three others prefer to give the local spa a visit. You and two others have had a heated discussion on Scrum@Scale in the chairlift and during lunch you would like to bounce ideas with others. Therefore, you post on our Slack-Channel that you would like to talk about this in the evening with everybody else who is interested in the topic. After dinner, you and five others meet in the training room (meanwhile another group is meeting in the lobby to discuss another topic). Thursday, 28 Feb: No new snow, but the slopes are in great condition and the weather is still looking pretty good. Meanwhile, Friday the forecast says it will be snowing all day. We decide to go skiing again and leave the last training day for Friday. Since the avalanche risk is down to "moderate" again, a group of 5 people decide to give snowshoeing a try. Some of the skiers cut the skiing day short and meet in the afternoon for beers a fun agile-poetry-slam around topics like "Agility in the public sector and government", "Personal-family-agility at home", "Kanban vs. Scrum", and other topics like that. A third group meets to design a new agile learning game with the purpose of showing the difference between focusing on effectiveness and efficiency. Friday, 1 Mar: The bad weather front went quickly through overnight, another 14 cm of fresh snow has fallen and the weather looks a lot better than what was forecasted the day before. However, we will be doing the second day of training and therefore stay in the hotel with Henrik. In the evening we say goodbye to some of the participants - the rest stays for one more day of skiing in Davos. On request, prices will be split into a work and a life part any way you want. Work would typically cover everything related to the course and life the rest. Good employers will pay for the work part. Great employers will pay the whole lot. There are a number of connecting rooms that can be booked for families who want a separate children's room. The children's room is half the price of the adults'. Ask for details if this of interests to you. You are welcome to register with as much information as possible below. We will consider this registration as a show of interest and will contact you by mail for further details.